Our logo was designed by a founder member. 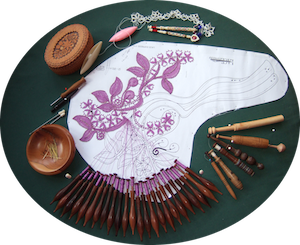 The lace classes started in 1980 at the Rockingham F.E. College, Wath-upon-Dearne, Rotherham, South Yorkshire. The college had an excellent reputation for its City & Guild courses. “Rockingham” comes from the local connections with the famous Rockingham Pottery of the 1800s. The original pottery was on the boundary of Swinton and Wath-upon-Dearne, West Riding of Yorkshire now, alas, South Yorkshire. Its name was taken from one of the titles of its patron and local landowner Earl Fitzwilliam of Wentworth Woodhouse. Refusal by the Prince Regent to pay his bills bankrupted the concern. “Lace edged” plates and dishes were one of their specialties. Rotherham’s Clifton Park Museum has a wonderful collection if you are interested in ceramics. Molly incorporated the kiln and their trademark griffin. The kiln is still standing in ruins but was used as a home from the early 1900s. 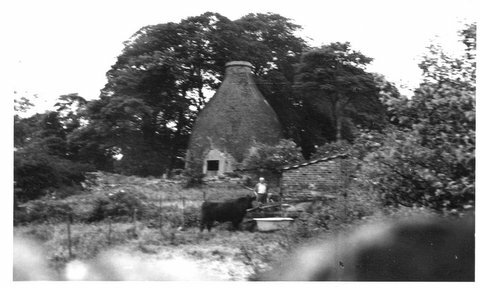 My photo was taken in 1956 – don’t you love the cow in the garden?